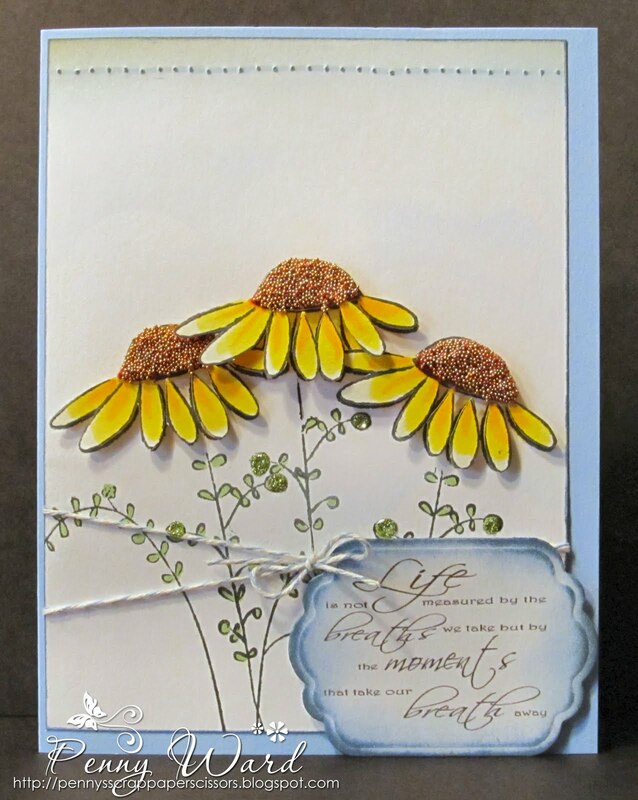 From the Penny Black Touch of Whimsy stamp set, I stamped and masked the flower 3 times. Colored them with Copics and added glass beads to the center of the flowers. Stickles were added to the leaves. 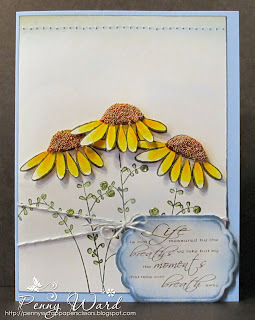 Sentiment is a digi, die cut with Spellbinders and inked the edge with Tim Holtz Faded Jeans. Used hole punch at the top, then lightly swiped ink pad over the raised impression. Attached twine. A really delighful card Penny and super dimension with the decoupaging. Thank you for sharing with us at Penny Black at Allsorts this month, good luck and hope to see you again. This is such a bright and fresh summery card. Beautiful flower image and I love the decoupage heads. Thank you for sharing your lovely card with us at penny Black at Allsorts and good luck in the draw. This is lovely Penny, the 3D effect gives a great dimension and the beads are fabulous, just bought myself a bottle of them. Many thanks for sharing with us at Penny Black at Allsorts.